Search Engine Optimisation (SEO) is essentially the art of persuading Google that a site deserves a higher position in its search results pages. Producing and marketing relevant, high quality content to an audience has become an essential skill, and there is a huge amount of information to wade through on the subject. 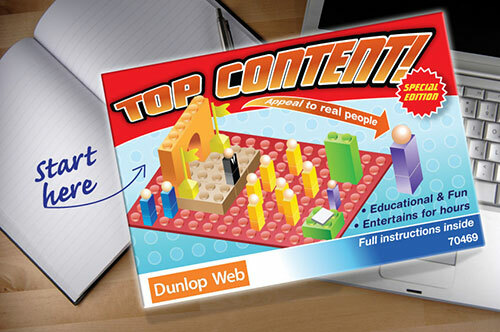 We have taken key areas and turned them into this Top Content! game for you to explore. Click on the image above to get started … as you click through you can see a fuller picture emerging. Clicking on the (i) areas flesh things out even further. The game comes in the form of a dynamic infographic, and it is aimed at those working with – or considering working with – content marketing. The Top Content! game was designed in association with Digital Marketing Day. – with help from Kath Dawson and Cindy Lau. Successful content marketing relies on following an ongoing plan to produce a steady stream of delicious content to share … we hope this guide will show you the way. This dynamic infographic was originally designed as a piece to explain the process of managing an event such as the Digital Marketing Day, but it was reworked as a guide to the content marketing process. In both, you follow a route from a black and white concept to full colour delivery. Want Your Own Dynamic Infographic? If you want to dicuss creating your own bespoke Dynamic Infographic, please contact Dunlop Web.